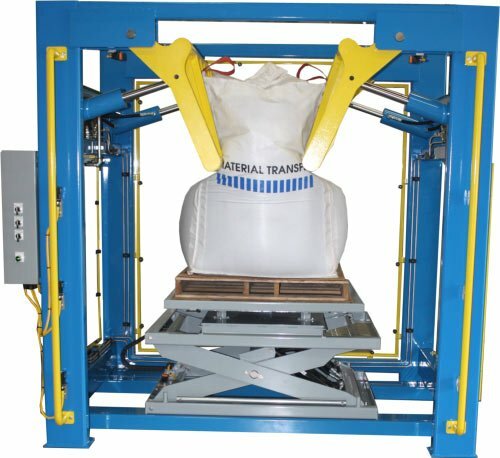 Powered rotary lift table with 36” of travel and 4,000# capacity allows complete conditioning of a wide range of bag sizes. Finished with standard gray Durethane. Rotary turntable motor includes a stainless steel safety cover. Unit includes two fork lift pockets for ease of moving to an alternate location. Clear acrylic guarding is provided on three (3) sides with three load side photo-reflective sensors for operator safety. NEMA 4 electrical enclosure with manual operation controls. Hydraulic system includes a Parker unit with dual pumps, carbon steel reservoir and a 5 HP motor.